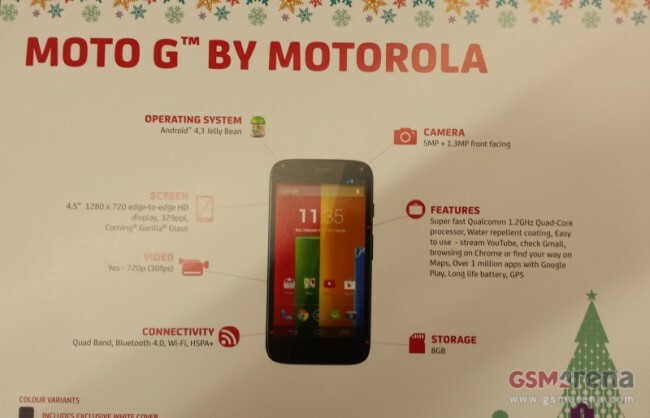 Thanks to a leaked promo card sent to GSM Arena, we can now wrap up any rumors that were surrounding the Moto G. Yesterday during all of the Nexus 5 madness, @evleaks posted up a tweet about a few of the specs you could expect to see from the device. Frankly, they weren’t all that impressive, and today’s leak pretty much confirms our stance. For now, we are looking at a 4.5″ 1280 x 720 HD display at 329ppi, a Snapdragon S4 Pro quad-core processor clocked at 1.2GHz, a 5MP rear-facing camera capable of 720p video at 30fps, Android 4.3 (that’s nice), Bluetooth 4.0, 8GB on internal memory, “long battery life,” and HSPA+ connectivity. Given the holiday theme of the promo card, we can expect to see this device around Christmas. Final thoughts before we never bring it up again? Friday Poll: What's Your Favorite New Feature in Android 4.4 "Kit Kat"